Kate, I'm here… sort of. Find Cameron. He knows. I shouldn't be writing. Don't tell. They'll hurt you. Ready for a fun sassy heroine that alternatively touches your heart and cracks you up? Grab THE LIAR SOCIETY! Kate Lowry will win you over in the first pages and carry you along with grace, determination and wit as she solves this thrilling tale. Kate's endearing personality drives the ultimate fun of this story. I loved her. She's still feeling the pain of her BFF's death but shows a strength bolstered by a laugh-out-loud sense of humor and fighting spirit. She teams up with the nerdy Seth with his not-so-smooth attempts to woo her. Gotta love his resilience in the face of Kate's rejection. Then there's bad boy Liam who adds a nice bit of spicy romance. But while sparks may fly, heavy duty romance will have to wait. This murder mystery requires some serious sleuthing and sassy Kate is up the for job. She doggedly follows clue after clue on a cleverly weaved path of intrigue and page-turning suspense. The exciting climax manages to give you all the answers but the final ending adds an unexpected twist that still leaves you hanging. 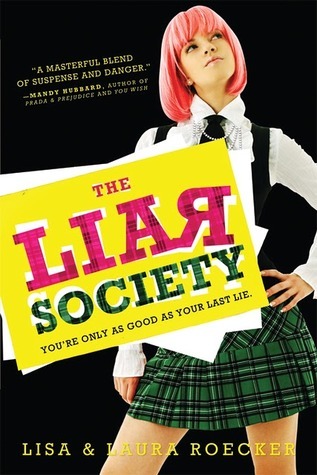 THE LIAR SOCIETY hooks you from the start with a delicious who-dun-it and one of the most delightful heroines in YA. Fresh, fun, witty, a great contemporary mystery young adults of all ages won't want to miss! We're lucky enough to be part of Lisa and Laura's THE LIAR SOCIETY Blog Tour of Awesome, which means tomorrow (Mar 22) when they're here with their Vlog Interview, they'll reveal a super secret password that you can use to enter to win a $100 Amazon gift card! That's why they call it awesome! So be sure to check back tomorrow. And if you'd like a chance to win an ARC of THE LIAR SOCIETY fill out the form below. I have heard nothing but fantabulous things about this. I hadn't heard about this book before, but it sounds like fun. Thanks for opening the contest internationally. I like reading books that have a twist I didn't expect. Thanks for the giveaway and the review. I've become curious about this one. Especially with the review. :) Thanks for the chance to win. Great review! It doe sound funny, and looks like it too. Glad you enjoyed it too! I agree...Kate was such a fun, sassy heroine! I like the bad boys but sometimes have to root for the nerdy guys too. Sounds like such a fun read. Kate sounds like the ultimate homegirl. I can't wait to read this book. Word. This book sounds hilarious. I would love to win a copy! Thanks a million for hte chance.